Catalan President Carles Puigdemont speaks in Barcelona, Spain, on Oct. 4, 2017. On Oct. 9, 2017, Puigdemont asked Catalan leaders to back down in their support of an independence referendum. The leader of Spain's Catalonia region is due to address members of the regional parliament Tuesday, while the government in Madrid worries Catalan representatives will vote for a unilateral declaration of independence. Catalan leader Carles Puigdemont did not reveal ahead of time what his message would be Tuesday. Political leaders, both domestically and internationally, urged Catalan leaders on Monday to back down to ease growing tensions in the country. Barcelona’s mayor was the latest to speak out against a declaration of independence, saying this would put "social cohesion" at risk. 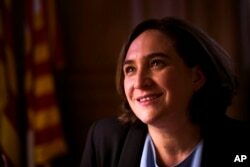 Ada Colau called on all sides to de-escalate tensions to solve "the most severe institutional crisis since the re-establishment of democracy in Spain." The head of Spain’s main opposition party, Socialist leader Pedro Sanchez, also called for Catalan leaders to drop an attempt to declare independence, saying "a universal declaration of independence doesn’t have a place in a state ruled by law." Germany and France also weighed in Monday against a split. German Chancellor Angela Merkel "affirmed her backing for the unity of Spain," but also encouraged dialogue, according to her spokesman. France said it would not recognize Catalonia if the region declared independence. "This crisis needs to be resolved through dialogue at all levels of Spanish politics," France’s European affairs minister Nathalie Loiseau said. Tensions have grown in Spain since last week when Catalonia held a regional vote for independence, an election deemed illegal by Madrid. Police cracked down on the vote, firing rubber bullets and storming crowds to disrupt the voting, leading to hundreds of injuries. A man, wearing a t-shirt reading in Spanish: "Please, talk" chats with a passer-by about the current political situation in Catalonia, in Barcelona, Oct. 6, 2017. Catalan leaders say 90 percent of those who went to the polls voted to break with Spain. However, opponents of the referendum say the vote did not show the true will of the region because those who want to stay in Spain mainly boycotted the polls. Police say about 350,000 demonstrators attended an anti-independence protest on Sunday. On Saturday, thousands of protesters gathered at rallies in Barcelona, Madrid and other Spanish cities to demand dialogue to end the dispute. 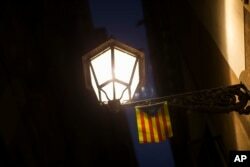 An "estelada", or Catalonia independence flag, hangs from a street light in downtown Barcelona, Oct. 6, 2017. Spanish Prime Minister Mariano Rajoy said he would not rule out using constitutional powers to take away Catalonia's autonomous status if the region declares independence. In an interview with the Spanish newspaper El Pais published Sunday, Rajoy said that he will consider employing any measure "allowed by the law" to stop the region’s separatists. The crisis has prompted several major banks and businesses to announce they will move their headquarters out of Catalonia to other parts of Spain so they can be sure they will remain in the European Union common market. Catalonia, a northeastern region in Spain, has its own language and cultural traditions. It is home to 7.5 million people and accounts for about a fifth of Spain’s economy.